Many factors contribute to being overweight and obese. With 19 years of experience specializing in medical weight management, Dr. Jessica Cho of Wellness at Century City, identifies the underlying cause of your weight problem and provides safe, effective treatment options. 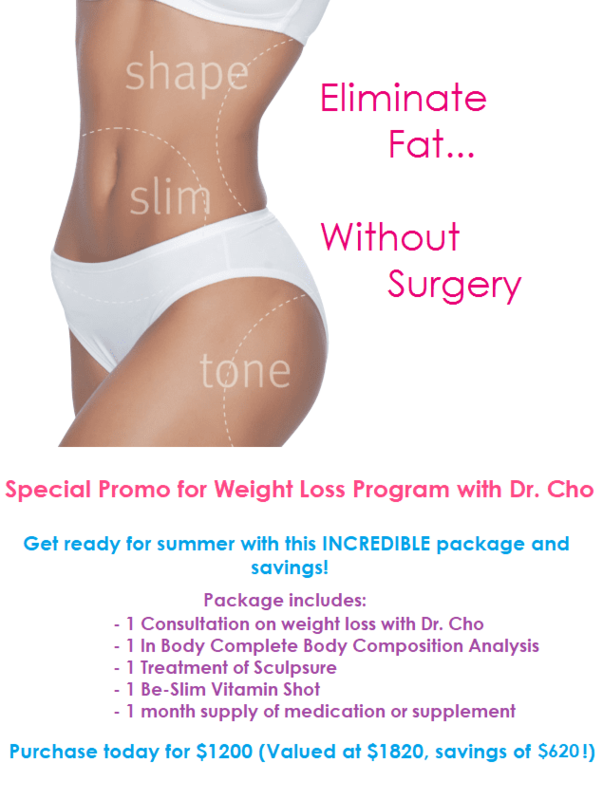 Whether you need to lose 10 pounds or 100 pounds, make an appointment with Dr. Cho so she can customize a weight loss program for you. To me, wellness is not an absence of disease, but rather a life full of happiness, health, energy, vitality, and passion. My wisdom as a doctor is firmly rooted in an integrative approach. I have been blessed with the knowledge of both Western and Eastern medicines, and my interdisciplinary background has enabled me to use a variety of tools to set up my patients for success. Thus, rather than treating just symptoms, I treat the whole person. I have a heart of a mom. I serve the purpose of a medical doctor to build a community where compassion, love, and good news are spread. I see food as medicine and I proudly create alchemies of natural remedies—herbs, vitamins, and nutrition—that will nourish and rejuvenate my patients in the most personalized way. I welcome the challenge of complex medical issues spanning from low energy to poor sleep, brain fog, weight issues, and hormonal and immunological imbalances. With my knowledge, I am excited to embark on the journey of healing and wellness with my patients. I tremendously enjoy helping patients with integrative weight loss programs because my patients are able to witness that weight loss can become natural and effortless only when the underlying root causes are revealed, understood, and healed. Although eating less and exercising may contribute to “good” lifestyles, they may not serve everyone as an ultimate or universal answer to the exhaustive quest for weight loss and weight maintenance. As my patients heal from a myriad of fundamental issues that stem from imbalances and deficiencies, they are not only able to experience breakthroughs in their weight loss, but they are able to restore their energy and vitality as well. My integrative weight loss programs begin with a “smart start”--a consultation where I spend the time to get to know the patient by digging deeply into the underlying root causes of their weight issues by asking “Why and How”. From my conversations, I have found that almost everyone needs to de-stress and recharge in order to be able to set up a successful foundation for weight loss. Additionally, the underlying causes of refractory weight issues most commonly stem from hormonal imbalances, poor detoxification, sleep & stress issues, insulin resistance, incessant cravings that stem from deranged hunger hormones like ghrelin & leptin, thyroid imbalances, and nutritional deficiencies. In some cases, heavy metal toxicities can even underly hidden endocrine & reproductive issues. Following the “smart start”, a total body composition analysis is performed. This analysis is essential in order to completely understand the health and weight of patients because traditional methods of assessing health, such as BMI (Body Mass Index), are often misleading. The total body composition analysis goes far beyond your average doctor’s office scale because it breaks down your body into three components of fat, lean body mass, and body water. It also gives an organized and easy to understand result sheet that provides you with a detailed analysis of your basal metabolism, the location, and distribution of your fat cells and muscles. Overall, it functions as an excellent guide to help you achieve your goal of complete body transformation. The program also offers a series of lipotropic vitamin injections that work to kick-start fat metabolism, instill a sense of well-being, boost energy, and curb appetites or cravings. There are several different vitamin shots available, and each can be tailored to the different needs of different patients. Furthermore, incorporating IV therapies will be the perfect fit for what my patients’ bodies say they desire. These IVs serve as “reset” buttons to revive the body to start the healing process. They are able to help restore organ function, replenish all deficiencies, rejuvenate the skin and hair, slim, and recharge energy. The IVs are able to directly feed vitamins, minerals, and amino acids into the bloodstream and into cells, creating a radical encounter inside the cellular environment to relax cortisol stress hormones, and to create calmness, boost immunity, detox toxins, and treat even autoimmune disorders, fibromyalgia, adrenal fatigue, etc. Lastly, I offer the most recent breakthrough technology in laser medicine, Sculpsure, to work on body contouring. Sculpsure is amazing in what it can do for you when you need stubborn fat in a problematic area that doesn’t respond to conventional exercise or diet permanently removed. You will get the permanent destruction of fat, up to 24% fat volume in just 25 mins. It is truly a lunchtime procedure; there is no downtime, no surgery, no recovery time, and it is backed by FDA clearance with research-proven efficacy. Whether it is stubborn fat in your arms, belly area, side handles, or thighs, it will be proven to be easy, fast, and effective--a game-changer in weight loss. So whether you want to shed a few unwanted pounds or you desire a complete body transformation, the integrative weight loss serves you to resolve the root causes by delving deeply into your fundamentals of health and wellness. Thus, your weight loss becomes effortless, natural and a true sign of total wellness of mind, body, and spirit.